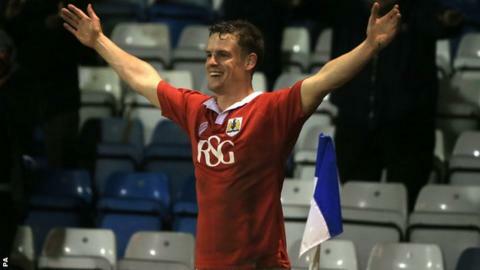 Bristol City have extended Matt Smith's loan spell from Fulham until 1 March. Smith will be unable to extend his stay with City again because an emergency loan has a maximum length of 93 days. "It's just very frustrating that we can't keep him any longer because of the effect he's had here," manager Steve Cotterill told BBC Radio Bristol. "He's come in and played a major part while Aaron Wilbraham and Kieran Agard have been injured, so as success stories go it's been brilliant." Smith cannot join any club permanently or on a regular loan until June because of Fifa rules limiting the number of teams a player can represent per season.